EMMITSBURG, Md. 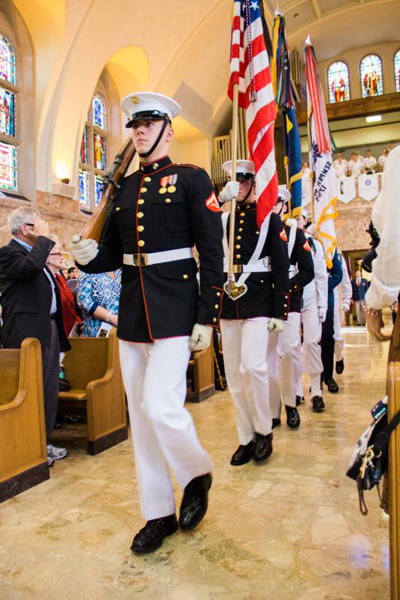 (CNS) — Members of the U.S. Navy, Marine Corps, Coast Guard, Merchant Marines and Public Health Services were recognized at the annual Pilgrimage for the Sea Services Mass Oct. 2 at the Basilica of the National Shrine of St. Elizabeth Ann Seton. Cardinal Theodore E. McCarrick, the retired archbishop of Washington and son of a ship captain, celebrated the Mass. It was organized, among others, by retired Adm. William Fallon. Hymns were sung by the Catholic Choir from the U.S. Naval Academy in Annapolis. The story of St. Elizabeth Ann Seton, who became a Catholic after traveling to Italy with her ailing husband, is familiar. The widow underwent many hardships, but founded the Sisters of Charity, schools and orphanages. She died in 1821 and was canonized as the first American-born saint in 1975. Less well known is that two of her sons, Richard and William, served on the USS Cyane and USS Macedonian, respectively. Her devotion to them led then-Msgr. John O’Connor, a former Navy admiral and chaplain and the future cardinal-archbishop of the Archdiocese of New York, to lead the effort to have her named “Patroness of the Sea” in the late 1970s. Fallon, whose education includes a Catholic high school in New Jersey and Villanova University, said Mother Seton’s work and entombment at the shrine that bears her name made it a natural location for the acknowledgement of those who serve at sea. During his homily, similarly, Cardinal McCarrick spoke of Mother Seton’s dedication to her sons in the Navy, and praised the service of the men and women in the armed forces. Almost every pew in the shrine’s basilica was occupied. A Joint Ceremonial Color Guard led the opening procession, and remained at attention for the national anthem. A local Knights of Columbus council also participated in the Mass. Afterward, worshippers conversed while enjoying a courtesy dinner provided by the shrine’s staff. Carol Birzer, a Navy veteran, spoke highly of the Catholic Choir from the Naval Academy, which had not sung in the previous Pilgrimage for the Sea Masses she had attended at the shrine. “It’s nice knowing we had a saint here,” said Birzer, of the grounds where Mother Seton lived and taught. Tony DiIulio, program director at the shrine, said he hoped the site’s beauty and history continue to draw people. Rogers writes for the Catholic Review, the news website and magazine of the Archdiocese of Baltimore.